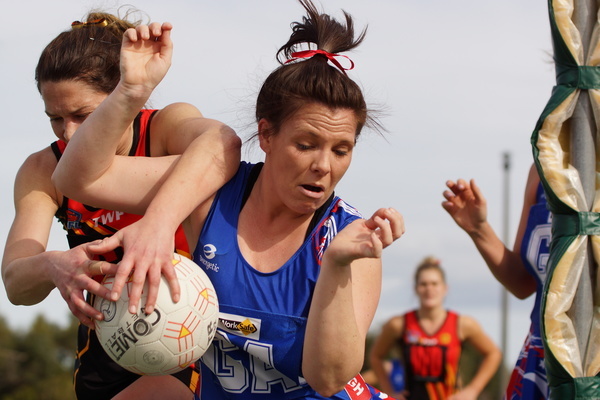 BACK-TO-BACK was not meant to be for Keysborough, as an inaugural Southern Football Netball League premiership slipped from its grasp with a 38-46 grand-final loss to Dingley. After switching to Southern (SFNL) this season, leaving the now defunct Casey Cardinia Football Netball League with a B-Grade premiership, the Burra was immediately thrust into the SFNL Division-1 competition – slotting in straight away at the top of the ladder. Keysborough had earned the week off, after defeating Dingley in the semi-final, but that result wouldn’t transpire again as the Dingoes learned the necessary lessons to best the Burra. Looking to earn back-to-back flags at the senior level, the Burra flew out of the blocks in the SFNL decider but shot by shot Dingley returned fire and surged ahead. Facing former clubwoman Penny Byers-Timms, the Burra could not halt the steady flow of Dingoes’ goals, or accurately enough hit their own. A 25-32 half-time margin spelled trouble for Keysborough, but to the side’s credit the initiative never slackened even in the dying minutes as the lead ballooned back out to eight by the final siren. Laura Agius battled on in the arc while goal shooter Elise Boyd stepped up in absence of Keysborough’s main 2015 shooter Chloe Plumb – who ruptured her ACL in the last minutes of the semi-final victory over Dingley. The gallant efforts of mid-court tandem Alana and Bree Vieceli stood out alongside captain Sam Downie – who threw herself around the back-half to try and stem the Dingley attack. “I think we maybe chose the wrong options down the court,” Downie said. “They applied some really good pressure and we just dropped it off and lost our run. Downie thought the Burra’s first year in the new league had been a strong one and the result gives them plenty of motivation heading towards 2016.